The book has been written in winter 2009, i.e. in the transition period between the George W. Bush and Barack Obama administrations. 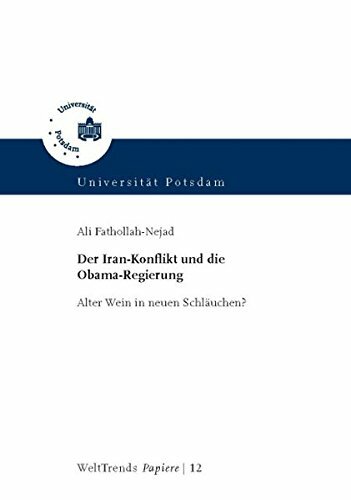 Ali Fathollah-Nejad (2010 & 2011) Der Iran-Konflikt und die Obama-Regierung: Alter Wein in neuen Schläuchen? [The Iran conflict and the Obama administration: Old wine in new skins? ], Potsdam: Potsdam University Press (WeltTrends-Papiere, No. 12), 2010 (reprint in 2011) [ISSN 1864-0656 | ISBN 978-3-86956-042-7]. —Luay Radhan, FriedensForum: Zeitschrift der Friedensbewegung, Jg. 23, Nr. 6/2010 (Dez. 2010–Jan. 2011). Key words | Iran nuclear conflict, Obama administration, Bush jr. administration, policy analysis, U.S. policy towards Iran, Israel, U.S. think-tanks, »coercive diplomacy«, sanctions, conflict resolution. Synopsis | With Barack Obama being elected as U.S. president, after years of a lurking threat of war against Iran immense hopes had emerged for a diplomatic settlement. The study analyzes Iran policy recommendation papers prepared for the new U.S. administration emanating from a whole range of influential U.S. think-tanks across the political spectrum. After noting the largely »Clintonite« nature of the foreign-policy appointments to the Obama administration, which in fact has been reflecting intra-élite consensus, the study proceeds to discuss Iran policy papers from both well-established as well as newly formed U.S. think-tanks which in the transition period between the outgoing Bush jr. and incoming Obama administrations were engaged in a race over determining the new administration’s policy towards Iran. Three main strands are identified: (1) Neoconservatives and liberal hawks favoured the continuation Bush’s confrontational approach and saw diplomacy – in fact predicated upon maximalist positions – as merely an indispensable tool in order to legitimize the recourse to war. (2) Mainstream élite think-tanks, believing that U.S. interests in the region has not been pursued adequately by the Bush administration, argued for an effort to engage Iran. However, within these circles the suggestions range from the belief that a »nuclear Iran« could be contained on the one hand to the possible necessity the »preventive strike« option on the other. (3) Moderate circles call for an entirely new course in U.S. policy towards Iran that embraces real diplomacy which would take Iran’s security and other interests into account. Countering existing myths about Iranian foreign-policy behaviour, they make the case for serious diplomacy and a sustainable engagement with Iran. The study concludes that the continuation of the »coercive diplomacy« – being a common denominator of the two first camps referred to above – is likely to continue. This is due to both the still significant influence of basically neoconservative ideas and institutions in Washington, DC, and to the lack of sufficient domestic political space for the pro-engagement camp. Here, U.S. but also Israeli interests take priority and it is basically demanded from Iran to subdue to them. The author agrees with the third camp that the »coercive diplomacy« has failed, is inadequate to bring about a resolution of the conflict and is even likely to lead to war. In diplomatic studies, »coercive diplomacy« denotes a policy that formally uses diplomatic talks but is essentially relies on the use of coercive political, economic and military measures to bring about the political opponent’s subordination to its own interests. Hence, a paradigmatic shift in U.S. policy towards Iran is needed where »diplomacy in good faith« is pursued and a reconciliation of interests between the U.S. and Iran sought. For a detailed English summary, see the interview I gave about the book. Notable | (1) The study’s findings that a »change« in Obama’s Iran policy is unlikely to occur and that in fact the coercive diplomacy employed thus far could be expected to prevail has proven correct in during the first Obama administration. (2) According to the publisher, the study has been a best-seller within the WeltTrends: Journal of International Politics publishing series. (3) In Feb. 2009, I gave a talk about the book’s findings at SOAS – with Dr. Elaheh Rostami-Povey (SOAS) acting as discussant.